WILLIAMS BAY, Wisconsin — George Williams College of Aurora University (GWC) now offers a four-year Bachelor of Science in Nursing (BSN) program that will help meet the state’s increasing demand for better-qualified nurses. Across the country, demand for nurses with four-year degrees is skyrocketing, fueled in part by an expanding elderly population and more chronically ill patients who are living longer. 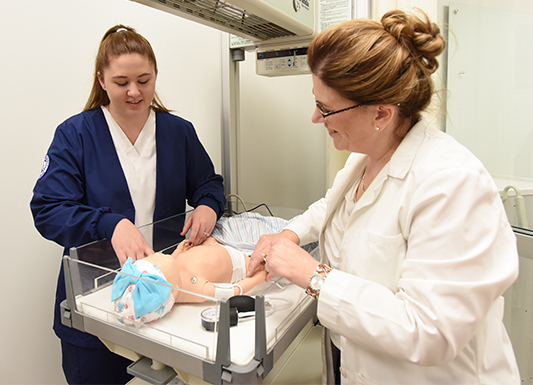 GWC’s state-of-the-art simulation lab features lifelike manikins — here an infant — that can be programmed to mimic real medical conditions and react to students’ treatment. In a report released in 2012, in fact, the U.S. Bureau of Labor Statistics projected that more than 1 million new nurses would be needed by 2022 to satisfy the country’s burgeoning need for high-quality health care providers. According to the Wisconsin Hospital Association’s 2016 Wisconsin Health Care Workforce Report, the vacancy rate for nurses working in Wisconsin hospitals has risen nearly 50 percent over the previous year and is now 6.2 percent. With 40.6 percent of the nursing workforce expected to retire during the next decade, Wisconsin alone faces a shortfall of almost 20,000 highly qualified nurses by 2035, a shortage that will affect rural areas most acutely. At the same time, the bar is rising on the level of knowledge and quality of care that is expected of newly licensed nurses entering the workforce. Many hospitals now require that new applicants hold a BSN — as opposed to an associate degree — to even be considered for nursing jobs. Today’s nurses must be critical thinkers, problem solvers and decision makers — all characteristics that require rigorous classroom and intense clinical experience. Accredited by the Commission on Collegiate Nursing Education (CCNE) and approved for admission by the Wisconsin Board of Nursing, the BSN program at George Williams College of Aurora University is committed to providing an innovative educational experience designed to produce licensure-ready graduates. Aurora University has a long history of preparing highly qualified graduates for leadership in a variety of health care settings. The BSN program housed at the university’s main campus in Aurora, Illinois, is known for excellence and its outstanding pass rate — 94 percent in 2015 — on the National Council Licensure Examination or NCLEX, the standardized test used nationwide to determine whether candidates are prepared for entry-level nursing practice. The pass rate is expected to exceed 96 percent for 2016. The GWC program merges the larger university’s existing strengths with an innovative new approach to nursing education, aspects of which include a holistic admission process and a collaborative teaching methodology that encourages mutual feedback and support among students and faculty. The core ideals of service and compassion are integral to the program. In support of the nursing major, GWC has opened new, state-of-the-art nursing skills and simulation labs to provide student nurses and faculty with cutting-edge learning and teaching environments. Here high-fidelity medical simulation manikins called “Sims” function as live patients, responding in real time to the care administered by student nurses. The nursing skills laboratory, developed to resemble a hospital care setting, includes low-fidelity simulation manikins. Here nursing students master basic skills, from starting an IV and administering medication to monitoring vital signs. Future additions to the labs include recording equipment, which will allow students and their instructors to review and debrief immediately upon completion of exercises. GWC also currently offers an online adult degree completion program (RN to BSN) for the associate degree or diploma-prepared registered nurse who wishes to continue his or her education. For more information on the nursing program at George Williams College, visit gwcnursing.aurora.edu or contact the Office of Admission at 262-245-8564 or gwcadmission@aurora.edu. To apply to GWC, visit gwc.aurora.edu/apply.